Guide: bulk Promotional Retro sweets prices. It's easy to get a quote for todays price for your own quantity and customisation. We'd love to hear from you. 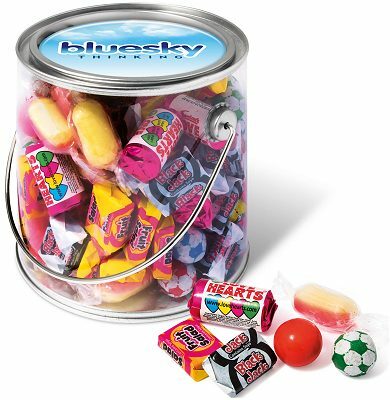 Filled with a selection of Retro Sweets this transparent plastic and metal bucket's lid is dome label printed with your promotional logo. For a sample at £10.50 (includes £5.50 UK tracked delivery) Get a quote in our easy contact form. You can type anything in that box so simply add your address and say Sample Please. Here's a preview of others - please ask Crazy Dave for details. We have more products than shown above. 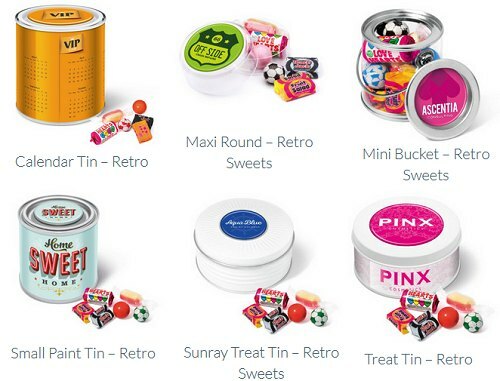 Please ask Crazy Dave about these Retro Sweets container options.